Followers of me on Facebook have surely noticed the tattoos bearing the same symbol over the past several years. People keep asking me what is up with those tattoos and what does that symbol mean? 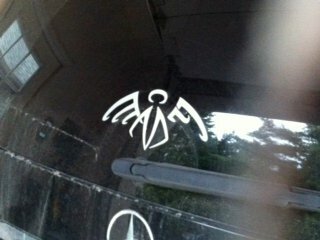 It is a stylized design of an angel with wings and halo. But, it is also letters that spell out MADY. Mady (Madyson Brendyl Law) was the daughter of a very good friend and client of mine. She had just turned 13 before her life was cut short by a tragic accident this past December. She touched everyone who met her with her kind soul and generosity. I could go on and on about her story and how she has individually impacted so many but that would make this long posting into a book! Back in the spring Jim, a friend of the Law family, commisioned me to design a decal for his Les Paul guitar in memory of Mady. He came to the shop with MJ and Laura (Mady’s parents) He wanted her name with some sort of “stylized wings kind of like the Van Halen logo, but not really too much like the Van Halen logo, because I don’t really like Van Halen.” After about a half hour of coming up with nothing very exciting I was growing frustrated. My policy is that if I am struggling with a design it is because I am on the wrong path and that I need to back up and come at it from another angle. Then, as all of my best ideas do, the image appeared clearly in my mind. Plain as day. I started sketching again and a few minutes later I had the rough idea down. 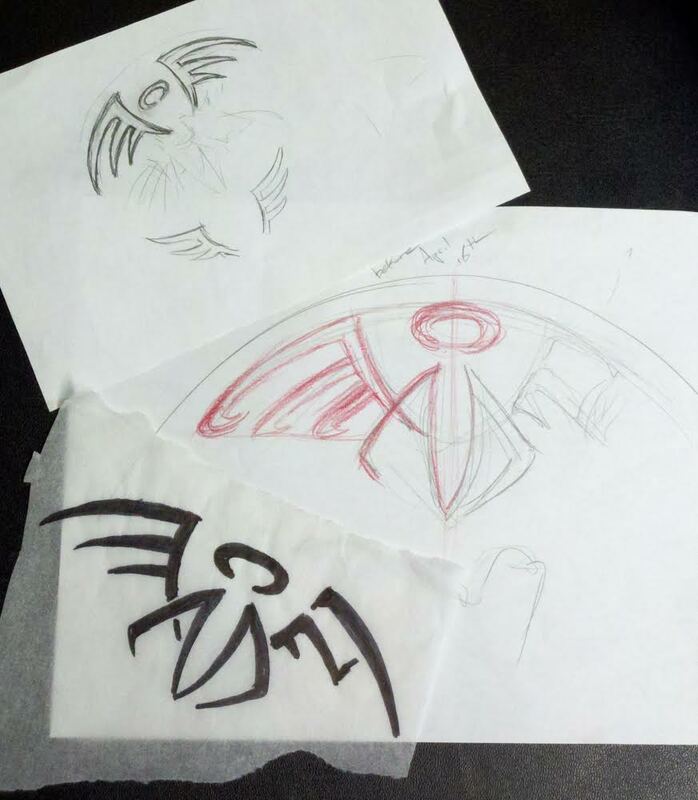 The first sketches, including tracing of the guitar body (middle) it was designed for. Being that this was for a specific guitar I made sure that the curve of the “wings” matched the curve of the body of the guitar so it would fit and flow correctly. After I was done sketching, he paid me for my time and we all sat and chatted about how happy we were with the concept. There was talk of using this logo on tshirts and car decals to sell as part of a spagetti dinner fundraiser that the Law family was planning. So the next day I refined the image and cleaned it up on Photoshop so it would be all perfect and ready to go. Then what happened next surprised me. Jim wanted to get it tattooed on him! So did another family friend, Robin. I am thinking wow, these people aren’t even related to Mady, and they want this tattooed on them? So I tattooed them on the same day as the first shipment of car decals. Then word started spreading. More people came forward about getting tattoos. 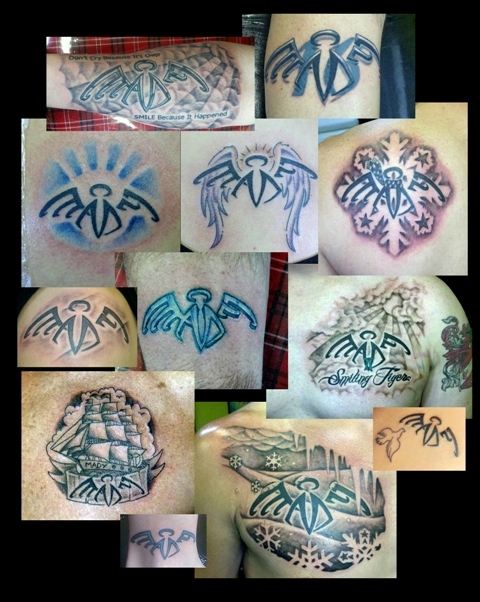 At this point I decided that I would donate 25% of all of the MADY logo tattoos to the charity Mady’s Angels being founded in her honor. As the weeks went by shirts and decals were showing up everywhere. Car Decal As I worked on MJs memorial backpiece he kept me filled in on the details of a charity music festival they were planning called “Mady’s Snow Day” (one of her favorite things in the whole world was snow). The outpouring of support from the community was tremendous. Many people and local businesses donated their time, energy, and space to make the event come together. I continued tattooing MADYs on even more friends and family leading up to this event. The day of Mady’s Snow Day was full of bone soaking rain, but that didn’t keep anyone away. As I drove up Sarah Street to park at the tattoo studio the street was lined with cars bearing the decal. People with umbrellas were walking towards the event all wearing the shirts. When I finally made it, I was in a visual sea of this symbol. People were wearing temporary tattoos with it. There was a booth filled with Mady merch. Stickers, decals, wall plaques, guitar pick jewelry, and more. Over 1000 people attended the event. Never in my life have I seen one person touch so many people that they would permanantly alter their bodies in her memory. I am sure I will never see anything like this again. It has been an honor to be able to help the Law family in my own little way by giving them this image. I know that this simple image will be one of my proudest artistic achievements due to the impact it helped to make. I hope it helps to carry on Mady’s legacy for years to come. I didn’t have the chance to get to know Mady very well in life, but through this whole experiece I have gotten to know not only her, but a lot of really good people better than I ever could have. If a 13 year old could touch this many people this deeply, how much good could we possibly do with a whole lifetime? In all, I did around fifteen MADYs. Each person had their tattoo done in a different way to reflect their relationship with Mady. They all shared their stories about her with me while I tattooed them. I am honored to have been able to take part in some small way in the great work that Mady's Angels is doing. Creating this symbol for them has been the greatest artistic achievement of my career. 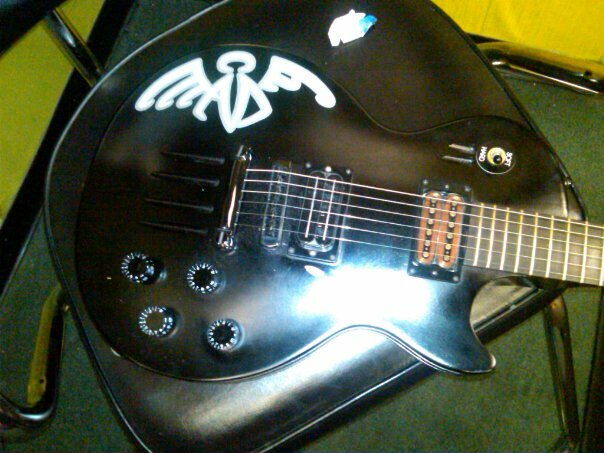 It is something that has transcended beyond its initial purpose of a simple decal for a friend's guitar in ways that none of us could have imagined. Even at this writing (Sept 2014) I still get text messages or tagged in photos of "MADY sightings" and I love it. It makes me smile knowing that Mady, is still out there, reaching, touching peoples lives in ways that we could never do alone.